Take part in an epic underworld battle with this LEGO Hobbit set. The goblins have captured the dwarves so it’s your job to sneak Gandalf the Grey past the Goblin King and set them free! With lots of different functioning parts and 7 exclusive LEGO minifigures, it’s great for 1 or more to play with. LEGO model number: 79010: The cave features The Goblin King’s throne with trapping function and a hidden treasure function, a working crane, a collapsing bridge, a catapult and a tipping ladder. Accessories include a map, skulls, bone elements, torches with flame elements, golden crystals and The Goblin Kings crown and bone scepter. Includes 7 exclusive LEGO minifigures available only in this building set – Dori the Dwarf, Nori the Dwarf, Ori the Dwarf, Gandalf? the Grey, The Goblin King, Goblin Scribe and 2 Goblin Soldiers, all with assorted weapons. For ages 9 years and over; EAN: 5702014961302. WARNING(S): Not suitable for children under 3 years old. To be used under the direct supervision of an adult. 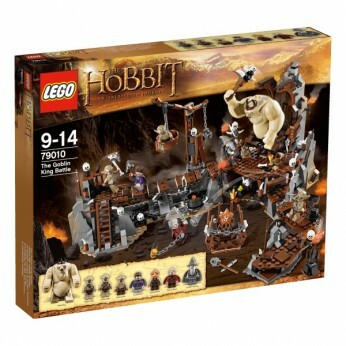 This toy costs approximately £59.99 (for the latest and best prices make sure you check our retailer list for the LEGO Hobbit The Goblin King Battle 79010 above). In our review of LEGO Hobbit The Goblin King Battle 79010 we classed it as being suitable for ages 6 years, 7 years, 8 years but recommend you check the manufacturer specific advice before purchasing.